(Long Beach, California) – A decade after its first appearance, the precedent-setting "Ship of Gold" display showcasing California Gold Rush-era sunken treasure recovered from the 1857 shipwreck of the SS Central America again will dock in Long Beach, California. The $10 million exhibit will be publicly displayed during the Long Beach Coin, Stamp & Collectibles Expo in the Long Beach Convention Center, 100 S. Pine Ave., February 4 – 6, 2010. The three-day show also will feature an exhibit of the all-time finest set of early U.S. half dollars in the PCGS Set RegistrySM. "The ‘Ship of Gold’ exhibit is coming out of dry dock and returning to its first port of call, the Long Beach Expo," said Ronald J. Gillio, Expo General Chairman. "The eye-opening display on the convention center floor is housed in a specially-constructed 40-foot long representation of the famous ship’s hull. This will be the first public appearance of the ‘Ship of Gold’ exhibit anywhere in the country in six years." The exhibit is courtesy of Monaco Rare Coins of Newport Beach and involved months of work to coordinate the display with collectors who privately own and now have generously loaned many of the items for the exhibit, according to Adam Crum, Monaco Vice President. "The ‘cargo’ on display will be examples of historic assayers’ ingots as well as San Francisco Mint and California territorial gold coins with a combined value today of over $10 million. One of the highlights is a huge, 662.28 ounce Kellogg & Humbert ingot. Weighing just over 55 troy pounds, it is the fourth largest gold bar recovered from nearly 8,000 feet blow the surface of the Atlantic Ocean where the Central America sank in a hurricane in September 1857 while carrying California gold from Panama to New York City," said Crum. There also will be one of the 13 recovered octagonal $50 gold pieces produced by the United States Assay Office of San Francisco, and the remains of a wooden cargo box that still contains approximately 110 Double Eagles as they were found on the ocean floor. Many appear to be 1857-S $20 gold pieces, apparently freshly struck at the San Francisco Mint when they were placed in the container for shipping. Visitors to the exhibit also will see the front pages of three 1857 newspapers that published amazing stories about the shipwreck, the ordeal of survivors and the devastating economic effects created by the loss of the gold. Bob Evans, the chief scientist on the 1980’s mission by the Columbus-America Discovery Group that located and recovered the fabulous sunken treasure, will be at the Long Beach Expo display each day to meet with visitors and present educational programs about the SS Central America, her cargo, crew and passengers. 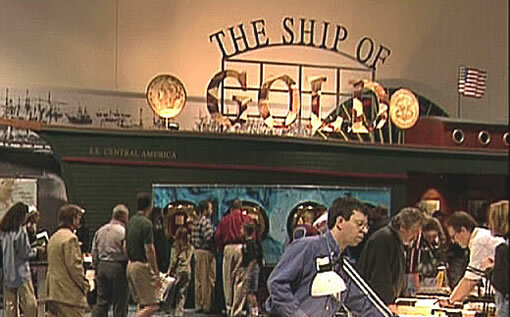 The Ship of Gold display was first publicly presented at the February 2000 Long Beach Expo. Over the next four years it was seen by over a million people in subsequent exhibitions in Long Beach and a half dozen other cities across the country. 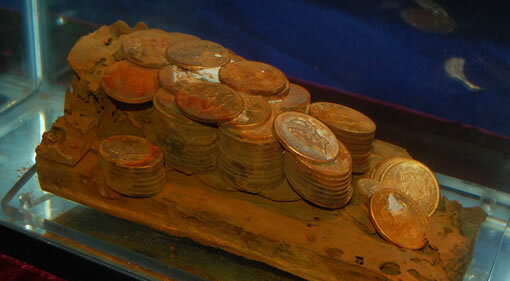 The "Ship of Gold" exhibit showcasing $10 million of recovered sunken treasure from the SS Central America will be displayed during the February 4 – 6, 2010 Long Beach Coin, Stamp & Collectibles Expo in the Long Beach, California Convention Center, 100 S. Pine Ave. The exhibit hosted by Professional Coin Grading Service of more than 100 coins in the all-time finest set of early U.S. half dollars in the PCGS Set Registry are from the collection of Dale Friend of Nevada, and 20 of the coins are either the finest or tied for the finest ever graded by PCGS. Friend’s basic collection of circulation strike early half dollars, 1794 – 1839, has been ranked number one in the PCGS Set Registry the past six years. His set with major varieties has been the best the past four years. Both sets have earned the honor of being the number one all-time finest in their category. The public hours of the Long Beach Expo are Thursday and Friday, February 4 and 5, 2010, from 10 a.m. to 7 p.m., and on Saturday, February 6, from 10 a.m. to 5 p.m. General admission is $6 (good for all three days); $4 for members of any coin or stamp club who display a valid membership card; and $3 for seniors 65 and older. Free admission for children ages seven and younger. Discount coupons are available online at www.LongBeachExpo.com. A free gold coin door prize will be awarded daily to a lucky, registered visitor. A children’s treasure hunt will be held on Saturday, February 6. Educational programs and collectors’ clubs meetings will be conducted during the show and are open to the public. 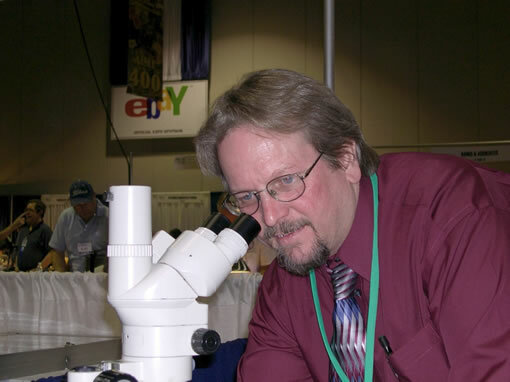 Heritage Auction Galleries of Dallas, Texas (www.HA.com), the world’s largest collectibles auction house and the official auctioneer of the Long Beach Expo, will hold a public sale of U.S. coins. For additional information, call Expos Unlimited at (805) 962-9939 or the Long Beach Convention Center at (562) 436-3636 during the show. The Long Beach Expo is a division of Collectors Universe, Inc. (NASDAQ: CLCT). we found 2 coins on the beach a week ago gold and silver I knw they r some kind of Spanish coins .